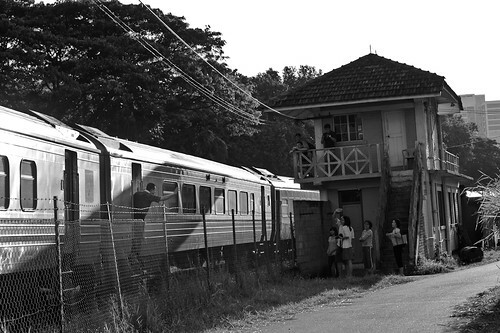 Tanjong Pagar railway station will be preserved as a national monument. However, the historic look will probably be gone once a new coat of paint is applied though…. 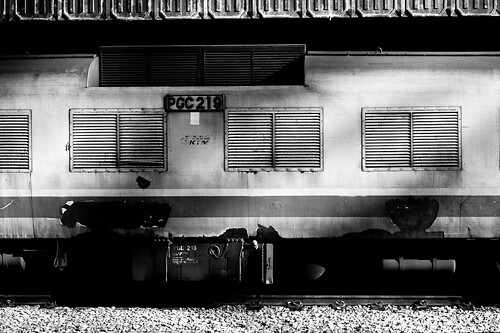 Sunlight glinting off a train cabin at Tanjong Pagar Railway station. The entire line starts from Tanjong Pagar station, crosses through Jalan Bukit Merah, Bukit Timah, and reaches a level crossing at Chua Chu Kang, after which it goes through Woodlands onto Malaysia. 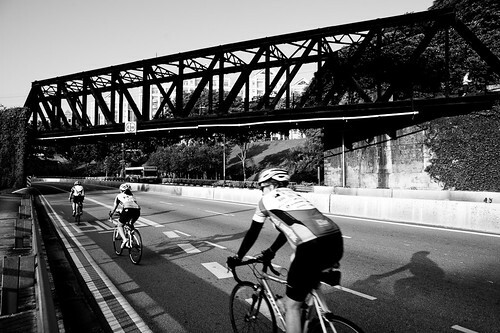 Along the way, it passes by a quaint station at Bukit Timah and 2 black Truss bridges. Black Truss Bridge over Upper Bukit Timah Road – there were only 2 active Truss bridges before the end of June that had active trains running through them. Sometimes events have a way of coming together in a way to conspire to educate and teach us certain important facts of life. This closure of the KTM Railway track running into Singapore from Woodlands all the way to Tanjong Pagar was one such event. I heard about the news some time back, but it never occur to me to document the story of this historic railway, which carried the first KTM train way back in 1932. 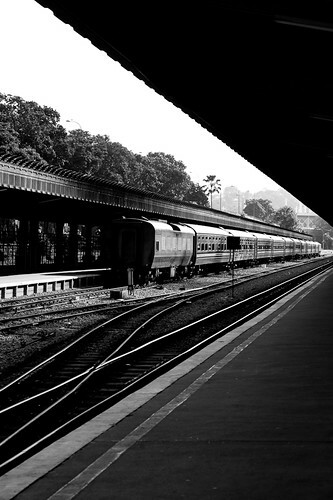 After 79 years of having a REAL trans-border train (as opposed to our newer, internal subway system), the tracks became silent on the 1st of July 2011 as the historic Tanjong Pagar Station, the Bukit Timah railway station closed and the strip of Malaysia owned land crossed by the track was returned to Singapore in a historic land swop deal. 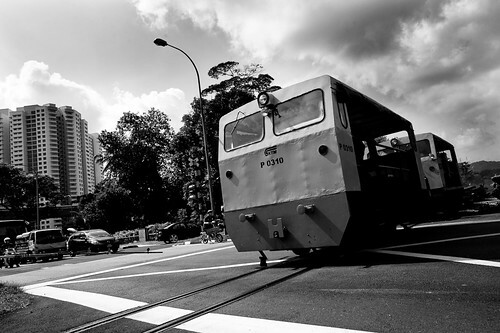 A train driver waves to crowds gathering to catch a glimpse of the KTM trains a few days before the service ends from Tanjong Pagar. It was, in the poignant words of one KTM worker, a case of “not treasuring what you have until you lose it”. There I was, a self made documentary photographer, and I had just barely missed documenting something smack in the middle of my own backyard. This was a story I could have done in my own time, without traveling. 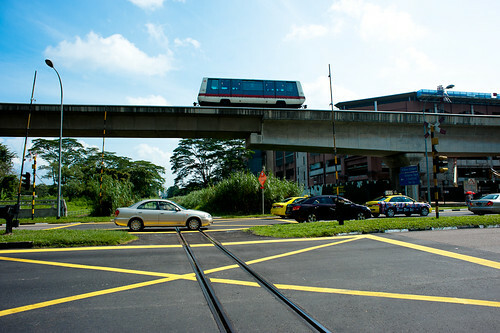 A KTM train running through the heart of Singapore, along the tracks spanning Upper Bukit Timah Road to the Chua Chu Kang Level Crossing. 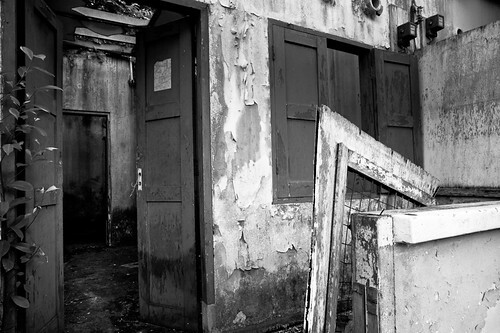 I mentioned I just “barely missed” because in the end, I did work 5 days in a last ditch effort to tell the story of the end of this railway line in Singapore. I am not normally into urban renewal and preservation / historical structure issues, but I finally caved in to curiosity about the railway (the bait laid for me by my friends was the promise of photography, and that was a lure I can’t refuse) and dragged myself out of bed one Sunday morning to join a few of my friends in a 4 km walk from railway mall to the Chua Chu Kang level crossing. 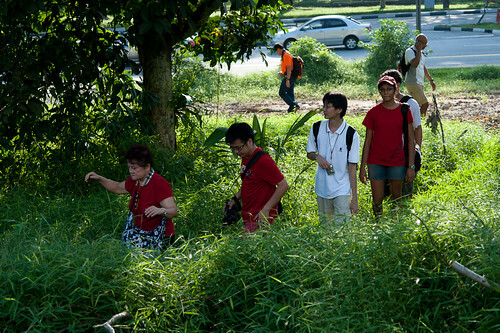 The walk was organised by Eugene of the Nature Society of Singapore (though not in an official capacity) in support of the Green Corridor Movement, a movement to preserve the stretch of greenery / natural ecosystem spanning the tracks. 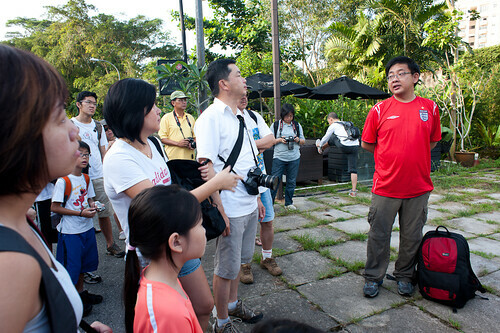 The leader of the walk was Jerome Lim, who runs his own blog with many articles featuring the railway, the Long and Winding Road. It has become a very comprehensive resource documenting the KTM railway. 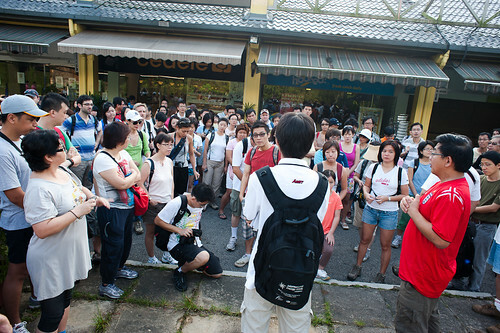 Jerome Lim, the leader of the walk. He runs his own blog featuring the railway as well. A Large Crowd gathers around Jerome as we prepare to set off for the walk. It was the last weekend before the railway closes, and the largest crowd yet! 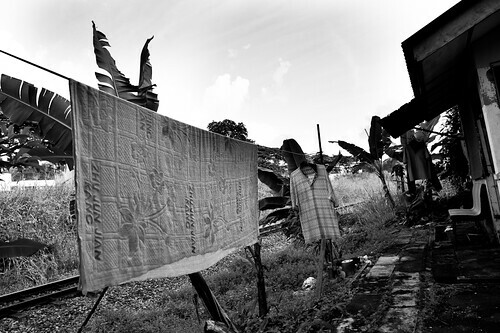 That walk changed my perspective and since then, in 5 days, I made a few trips to visit the stations, befriended the station masters, chatted with railway workers and hawkers selling food at Tanjong Pagar station…. it’s amazing that there was an entire sub-culture of railway travel along this somewhat innocuous line which was hardly mentioned or heard of until it was decided that it will be closed down. we had to trek through some thick undergrowth to reach the tracks. Land where the tracks run through previously belonged to Malaysia. It has since been returned to Singapore. 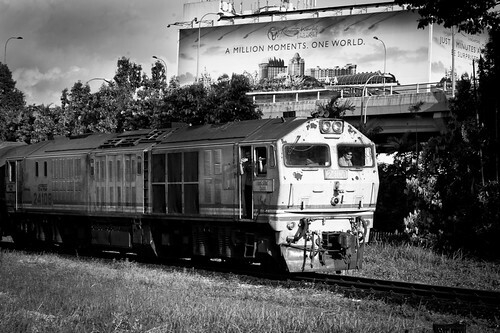 Regrettably I started photographing and documenting the KTM railway too late. This “personal project” was not a long-lived one, simply by virtue of the time I had till the eventual closure. In this 5 part series, I hope to tell the story of the last few days of the track, and preserve memories of a historic railway our next generation will never get to see. 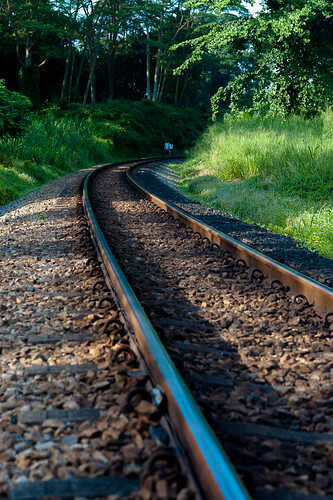 A idyllic walk along the tracks – one can see the lush greenery surrounding the tracks that the Green Corridor Movement is fighting to preserve. 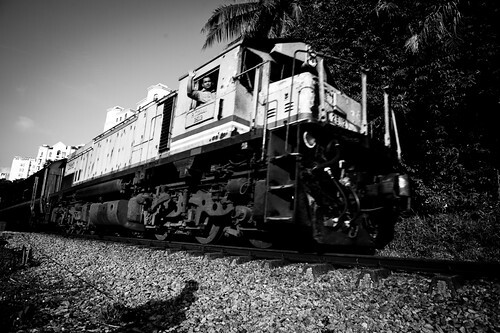 We trekked along the tracks, savoring the moment and soon reached a level crossing near Mindef. This is a small crossing, unlike the major one further down the tracks. 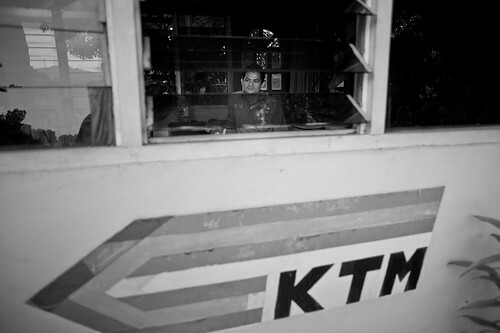 A KTM station master at a level crossing near Mindef. The station master was very stressed because in the last few days, many had scrambled onto the (live) tracks taking photographs, and this has made his job difficult as he tries to keep the tracks clear of people. 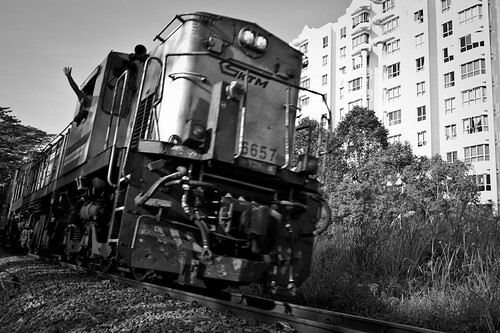 Accidents can, and did happen along the tracks involving deaths in the past. 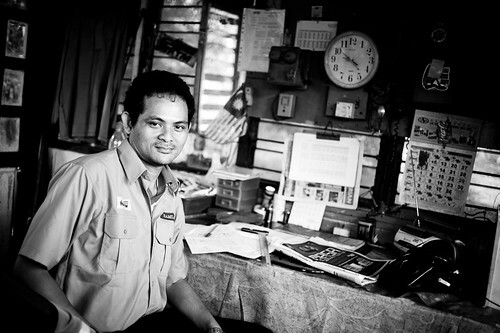 A KTM Station master – there’s always time for a portrait in the midst of busyness! Note the Malaysia flag in the background – the tracks, stations and all railway property belongs to Malaysia. We finally reached the Chua Chu Kang level crossing, the biggest such level crossing in Singapore. There’s a new LRT (Light Rail Transport) train running over the soon to be abandoned railway tracks, a case of the new superseding the old. All traffic comes to a standstill as a maintenance train makes its way over the level crossing. 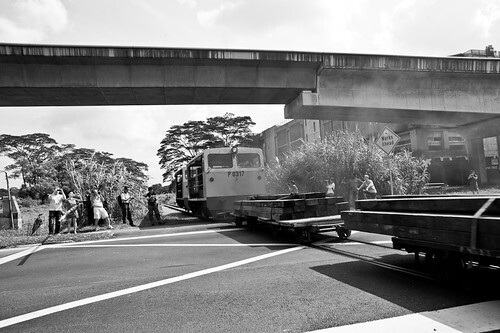 A maintenance train drives through the Chua Chu Kang level crossing. This post focuses more on the trains themselves, as well as the important landmarks which the tracks passes through. 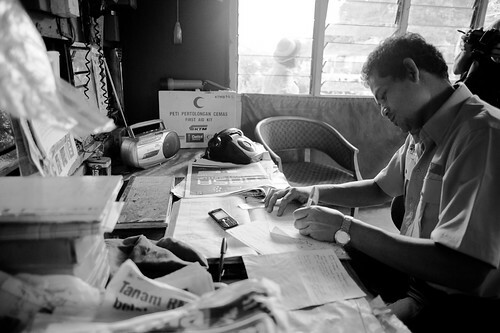 In the next post I will feature more of the people of the KTM railway. This is a big project despite me having only 5 days to work on it. I have a great many images to share. Till Part 2….. Enjoy! A small crowd gathers to wave goodbye to a train leaving Tanjong Pagar Railway Station.